Preston Lee's Blog – Software craftsman. Because I’m such a nice guy, I’ve extracted the code and released an easy-to-use client as the space_elevator gem. When combined with gems like thor, it makes writing bi-directional command line API clients a breeze. You can publish/subscribe to multiple channels simultaneously, and all in an event-driven manner. Check out the channel-y goodness and don’t forget to file any issues! Confreaks just released a Ruby/JRuby GPU presentation of mine from Mountain West Ruby Conference 2011 in Salt Lake City, Utah. Slightly stale, but all still very relevant to HPC today! After a long period of inactivity I’ve updated the F/OSS ruby-prolog gem! It’s been updated for ruby 2.0.0, bundler, and minitest, and released as v1.0.1! ruby-prolog allows you to solve complex logic problems on the fly using a dynamic, Prolog-like DSL. Basic use is encompassed by stating basic facts using your data, defining rules, and then asking questions. Why is this cool? Because ruby-prolog allows you to leave your normal object-oriented vortex on demand and step into the alternate reality of declarative languages. There are no control flow statements. You can use all these wonder things — it’s still Ruby after all — but they’re not needed, and mainly useful for getting data and results into/out of the interpreter. Prolog still tends to be favored heavily in artificial intelligence and theorem proving applications and is still relevant to computer science curricula as well, so I hope this updated release proves useful to the Ruby community. Check out a simple ACL enforcement example or, for the daring, the ruby-prolog solution to the Tower’s of Hanoi problem! Thinking of upgrading your vCenter Server Appliance from a 5.0 image to the 5.1 image using the official VMware upgrade process covered in the documentation? Don’t do it. It fails somehow. Every time. Unexpected error during the upgrade process. 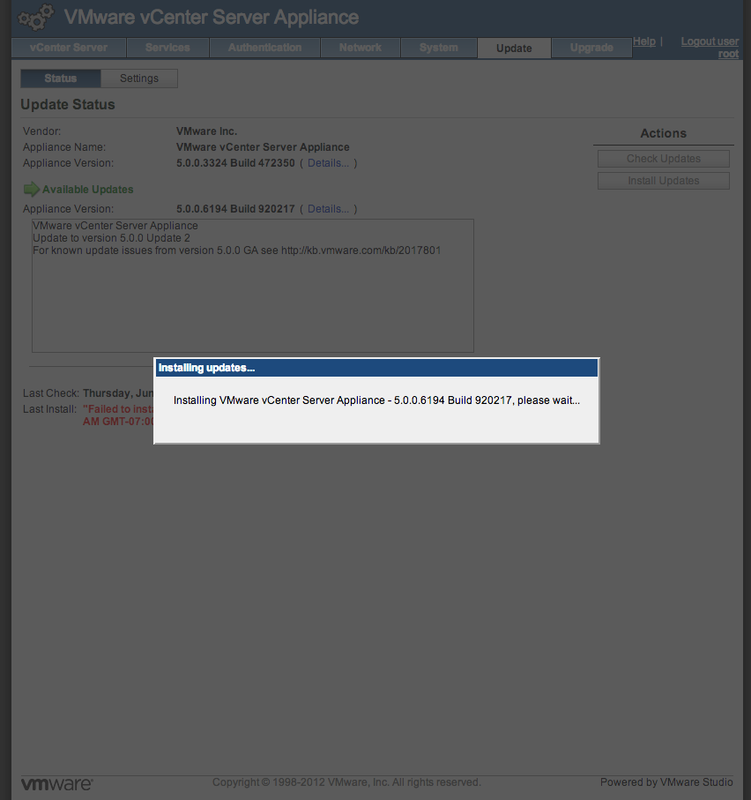 To attempt to upgrade again, restore the old vCenter Server Appliance and external database from backup/snapshot, deploy the new vCenter Server Appliance again and start the upgrade process from the beginning. Yeah.. you read the right. 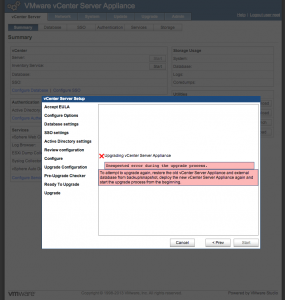 Now both your old and new appliance images are b0rked, and you’ll need to restore from the vCenter 5.0 backup that you definitely made before attempting the upgrade. 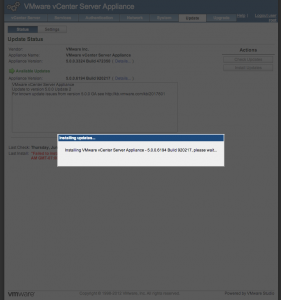 In private emails, VMware has acknowledged the issues and has advised to stick with 5.0 and hold off on upgrading the vCenter Server appliance until the next major release since the upgrade/migration tools are such horrible crap. Time to sit back and wait it out! I decided to give it a try with stack of old DVDs. The promo pricing is totally reasonable, but I doubt it’ll last. (50% off when you “convert” 10+ discs, then $2 off your total.) Your existing DVD/BD titles are $2 to convert, or $5 for upgrading a DVD to HDX. For the content I successfully converted, HDX quality is great. Some big caveats to considered before jumping in, though.. 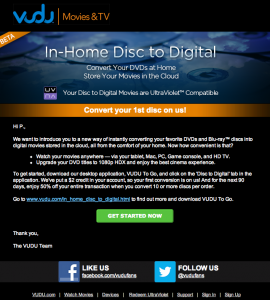 The Vudu To Go client necessary for the disc matching and verification process is buggy. On my Windows 8 Pro laptop — the only machine I have with a BD player — Vudu To Go would check for BD titles but outright refuse to check normal DVDs, displaying only a nasty error message. I had to use a secondary OSX machine (with a non-BD DVD player) to check DVD titles. I didn’t have any issues with my shopping cart when using two machines, but this was really inconvenient. I would think Vudu To Go on Windows 8 Pro would have the bugs worked out by now. The disc-to-digital disc matching mechanism seemed to mis-match about 1 in 15 titles, such as my retail BD version of “Full Metal Jacket”. 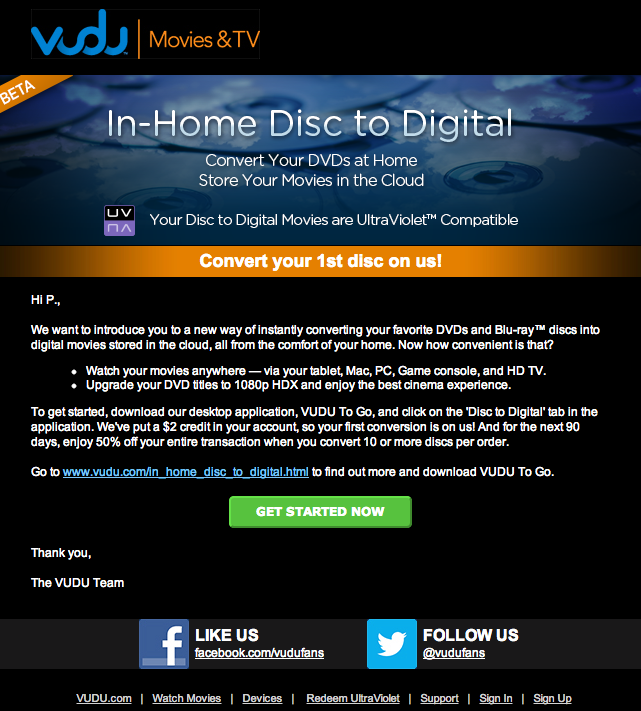 Of my properly-recognized discs, Vudu only had rights to convert ~40% of the discs I tried. Understandable, but still a pretty low hit rate for users, especially for anyone like me that would really like to completely toss all discs in the trash, and don’t even have a DVD/BD player hooked up anymore. For HDX quality, both machine and display *must* support HDCP. For example, “owning” Super 8 in HDX would only play in SD when web streaming due to my non-HDCP monitor. Studios, of course, still place restrictions on your watching abilities, even though you’ve verified the disc. For example, I “own” 80’s comedy “Singles” in HDX, but “[t]his title is viewable on PC in SD only.” Lots of stupid crap like that. Web streaming requires flash and uses a non-trivial amount of CPU. On my new brand new Dell Latitude 10 ST2 Win8 RT tablet, it’s totally unusable. I hope Amazon launches an equivalent, because I’m already committed to an Amazon content library and really, really, really don’t want to keep another vendor. If you only have a few stacks of decent titles just taking up space, though, it’s worth considering! Are you Googl’ing around trying to figure out why you’re getting this error when trying to `do-release-upgrade’ your Ubuntu 12.10 system, even though you’re pretty much up to date? …and you should be rollin’ towards Raring!